Well researched and useful for both tech geeks and novices, must haves for people that use iPads for school and work. 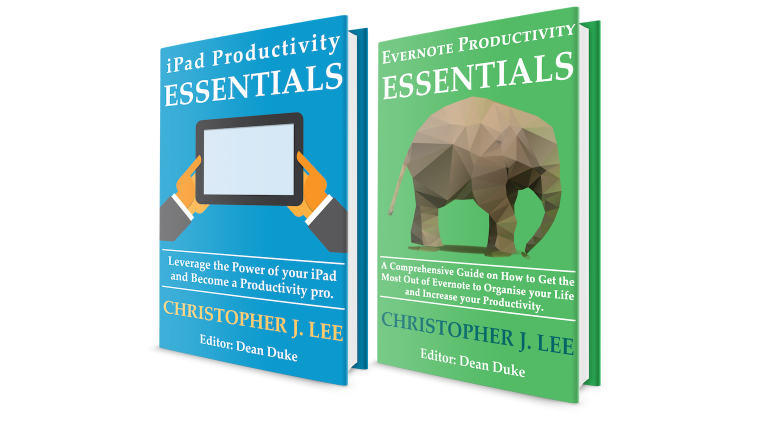 ‘Evernote Productivity Essentials’ and ‘iPad Productivity Essentials’ written by Christopher J. Lee (edited by Dean Duke) could be the next addition to your eBook shelf. These guides are well researched and useful for both tech geeks and novices, must haves for people that use iPads for school and work. He has obviously put a lot of thought and time into these books, which (for me) makes them even more of a joy to read. As a student of languages, I have to constantly take notes and make presentations, usually without access to any computers. Every day, carrying around a heavy bag full of notepads, folders and pens, just to try and keep organised (and with very little luck!). I have been an avid user of Apple products all my life and considered myself to be a bit of an expert (well, when it came to troubleshooting minor problems in any case). I have been a proud owner of an iPad since early 2013, but never really used it for anything more than games, Facebook and Tinder. Reading these guides allowed me to unlock my iPad’s full potential and carry only a small fraction of my usual rucksack weight! What I found especially useful were the reviews of different apps in ‘iPad productivity Essentials’. This helped me to choose good apps for myself, without buying all of the suggested ones and wasting money that don’t work for me. Chris has reviewed different apps, suggested cheaper versions and listed the pros and cons of each. This made it especially easy for me to find what I will need in the future for my iPad. I like that both books are written in layman’s terms, so even the least tech-savvy person in the universe can understand them. Anyone can use their iPad at work or school in order to maximise their productivity! I found the pictures especially useful. I have never used Evernote before, so the screenshots made Chris’ instructions even easier to follow-as someone who is more of a visual learner, this was perfect! I found that my own productivity at university increased as a result of reading these books. All of my files are stored safely in once place, and I don’t need to spend a lot of time searching for the correct documents, either. I am also a lot more mobile whilst working, makings studying so much easier! The thing I found the most useful about ‘Evernote Productivity Essentials’ was all of the many ways you can put notes onto it. I always thought that Evernote was just a simple note taking app. Boy, how wrong was I? Chris helped me to realise that Evernote is a one stop shop for all methods of getting information. You can use voice notes, photos and even scan business cards and link them to social networking sites like Facebook and Linkedin to gain more information. These short, helpful books complement each other very well. I have been able to turn my failing ‘staying in the library until all hours’ method of working into one that works and means I can also travel while doing it! My iPad has now become my single most important item for studying; I will not leave my flat without it! These guides make the most complicated apps so much easier to follow and understand. I found enjoyment in the background reading that Chris has included in these books. It helped me to clarify why I should use his suggested apps and gave me more reasons to believe his justifications with the use of other blogs. Of course, the best part is that I can store much more information at only a small fraction of the weight that I am used to. My back and shoulders are grateful! If (God forbid) my iPad breaks and I can’t use it, all of my work and information is automatically backed up on the iCloud! A problem that I know is common with laptop and computer users is not enough hard drive space, or losing your USB stick-a story I know all too well. I’m glad that I don’t have to worry about this again. I don’t have to deal with the ‘blue screen of death’ either! MailChimp vs Campaign Monitor – Which Email Marketing Service is Better?